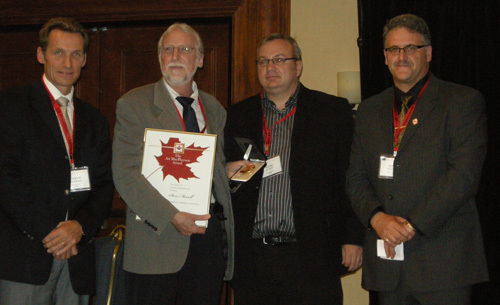 Dr. Steve Morrell was recently awarded the Art MacPherson Award by the Canadian Mineral Processors Society of CIM. Steve accepted the award at the 2011 SAG Conference in Vancouver in September. The award is given from time to time on the basis of 'significant contributions to the advancement of comminution' and is sponsored by SGS Lakefield Research. Art MacPherson, whom the award honours, had a long history of contributions to the mineral processing community in the area of comminution. He passed away on September 25, 2000.